There are those of us who know the importance of continually improving our riding skills. And there are those of us who enjoy the benefits of saving money by doing most of our own level one and two maintenances at home. Perhaps you fall into one or both categories. And perhaps you’d like to improve on what you already know. For more than two decades, Jesse Murphy has been instructing riders in both categories. 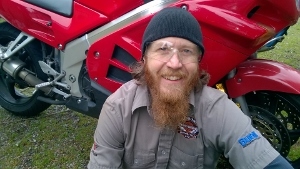 He often presents maintenance clinics in the Pacific Northwest as well as provides riding instruction on a one-on-one basis. As for the maintenance side, Murphy, a trained tech by trade, provides instruction in several ways. He’s available to teach at rallies, club events, or set up a custom classroom event for special groups. But even better, he’s available to teach/tech with a rider one-on-one, a very unique way to improve your wrenching skills. In the latter scenario, Murphy works with the rider to focus on a specific task, like level one or level two service, chain replacement, suspension rebuild or modifications, brake fluid change, tire changing and otherwise. The rider does most of the work while Murphy stands aside and coaches, sharing his decades-deep wisdom of why to perform the work a certain way, what tools and lubricants work best, how to properly adjust a chain and much more. His hourly rate for this training is about what you’d pay a tech at an independent shop to wrench your bike for you. The value is you’ll leave with all that knowledge and be able to apply it next time you work on the bike alone. As much as Murphy enjoys wrenching and teaching others the skills, he also likes riding and doing it better with every mile. When he’s not teaching rider education with local contractors, he makes himself available for one-on-one training with individual riders. One-on-one training can accomplish one of two things. For new riders who feel they need more time on the bike with a mentor, Murphy will ride together with them and provide feedback during each session. For skilled riders who are savvy enough to know we can all be a better rider, Murphy will work with the rider to determine what their current issues are and move them beyond their current level. Some riders want to be better at cornering, some want some help in the areas of throttle control or braking techniques, while some, after decades of riding, or having just returned to riding, want to feel more confident on public roadways in general. The one-on-one experience provides the rider with focused training in real-time not available any other way. It also provides each rider a chance to train on public roadways rather than in a parking lot or at a closed track. Murphy has been a staple the last few years during the Rally in the Gorge where he provides a suspension clinic and support on the Maryhill Loops Road training sessions. If you haven’t come up with a New Year’s resolution yet, consider becoming a better rider or get better at teching your bike, check out the Truitt website and perhaps engage some of your time with Jesse Murphy to kick things off in 2016. For more information visit the Truitt Motorcycle Education website at http://www.truitteducation.com/ email motorcycleclass@gmail.com or call (206) 595-0096.